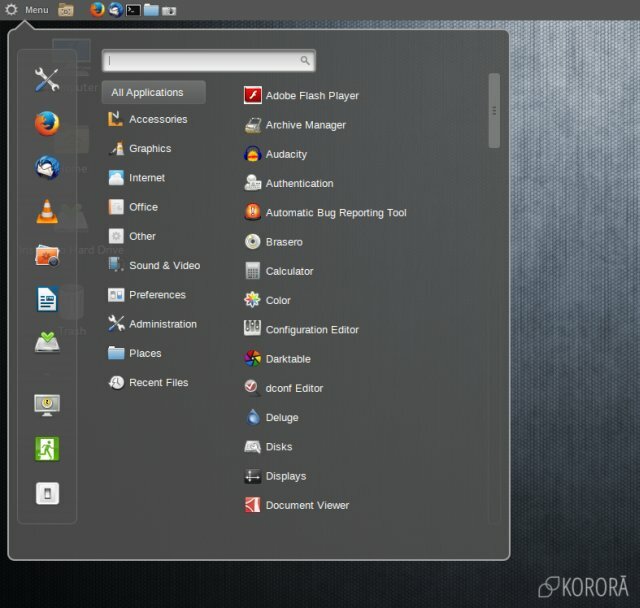 Korora is a Linux distro with all the drama of EastEnders, sans the accent. Although its Aussie heritage does give it a bit of a funk when speaking. Now, the distro used to live, then die, then it was resurrected, and finally got its name changed. We did fiddle with Kororaa, its past extra-A incarnation, and it was a decent sort. Now. All right. 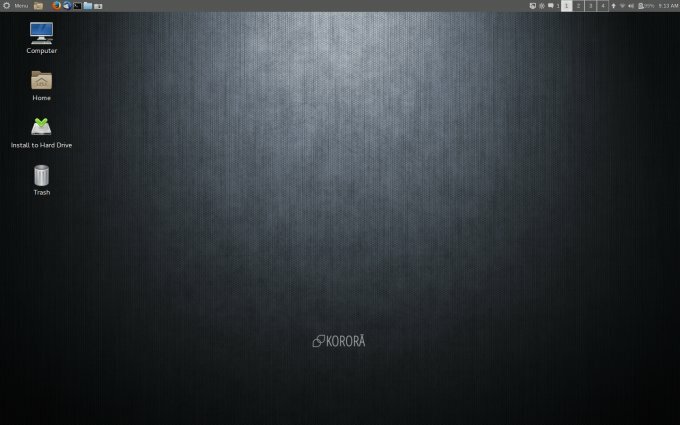 Korora 20 bases itself off Fedora 20. Except that I took a Cinnamon edition for a review, and tested it on my Intel-powered T61 laptop, which also happens to house a couple of SSD. To wit, please continue reading. Things went well, and the distro came up proper. What you get is a simple desktop with a colorful, non-uniform styling. On one hand, you do get the Cinnamon framework all right, but unlike Mint, you still have the Gnome thingie underneath, and it shows. For example, when taking screenshots, the desktop vanishes, leaving you only with the wallpaper. The system tray items and notifications are slick and useful. The menu is also standard Cinnamon stuff, but since it is located at the top, and drops down, it covers the desktop icons, and being transparent to a degree, this creates somewhat of a jarring visual effect. Another interesting element you will notice is that applications show in the top panel at the center, expanding sideways, rather than being flushed to the left, near the menu and its assortment of shortcuts. This is rather unusual. In fact, the more you use it, the more you start noticing the mix of styles. The icons are Gnome and then not quite. 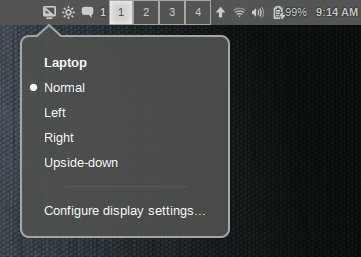 You have one type of fonts in your programs, another in the system menus, Gnome versus Cinnamon. Windows decorations and application icons and desktop effects, all of these seem to come from different sources, not quite aware of one another, making the total integration not so complete. 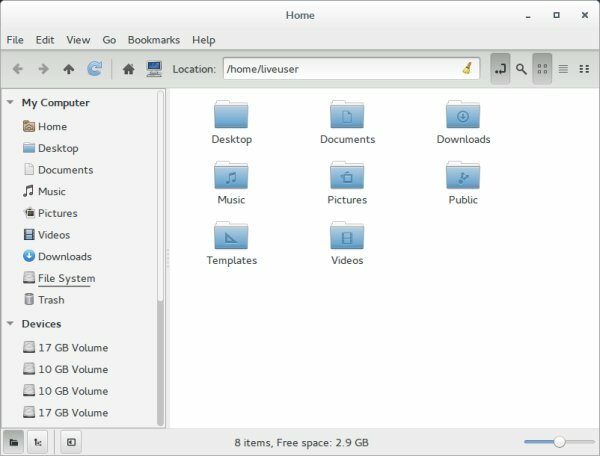 The file manager is classic Gnome, which makes me wonder about Cinnamon. Are we just talking about installing the Cinnamon package from the repository, and that's it. If so, lots of the underlying bits and pieces won't change. At this point, you will notice that pretty much every action, including minimize/maximize of windows is accompanied with a short, abrupt chirp. Rather than being pleasant and making your session more melodic, the noises have that 8-bit feel and really annoy you. Within just a few short minutes, I turned them all off in the system settings. No worries, it worked fine. 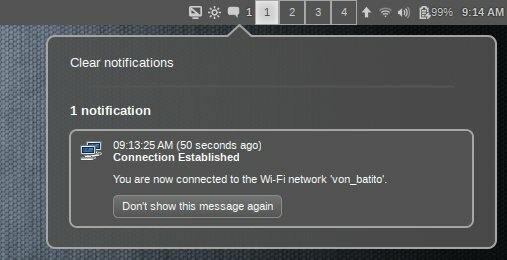 I tried Wireless, without any errors. Likewise, Samba sharing was fine, including WINS name resolution, so you can go directly to your Windows drivers by using names rather than IP addresses. Well, most distros do this, but still. No issues here, either. Flash and MP3, Alles Klar Herr Kommissar. Or as the Aussies would say, Aerial pingpong. Neat. We go back to Fedora. The procedure is identical to the new thing added sometime in Fedora 18 and used since. 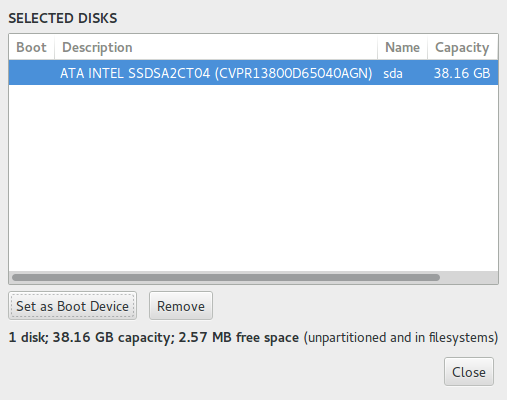 Not very intuitive, and you must be careful when figuring out the bootloader and partition layout. No fancy slideshow for you. The setup was extra tricky because there are two identical disks, both with the same name, so first, you need to figure out which one you want to use. Then, if you do not wish to kill the existing bootloader, uncheck that option BEFORE making partition changes. Finally, if you go with the manual setup, you will need to mark the desired partitions and update changes. Wait, what? Dedoimedo, are you not supposed to show us what happens after you install Korora? Well, I tried, but couldn't really do it. After setting up the bootloader in Ubuntu, which rules the MBR on this be box, I fired up Korora. It stalled, with similar symptoms that I encountered with RedHat 7 Beta some time back. The weird thing is, I did not see this happen with Fedora, off of which both these are based. Extremely weird, and totally not debuggable in any way. So I booted off the USB stick one more time, to show off some extra stuff. Not in any way comparable to a proper installation, but at least we will take a look a the apps collection and try to print. If there's one thing Korora excels at, it's its arsenal of software. Then again, it is too big and colorful and maybe even confusing. There's a bunch of everything crammed into the image, including some rather weird choices. That's what happens when you are no longer limited to just a CD-sized image. Go wild, spread your wings. For starters, you get all the usual treats. 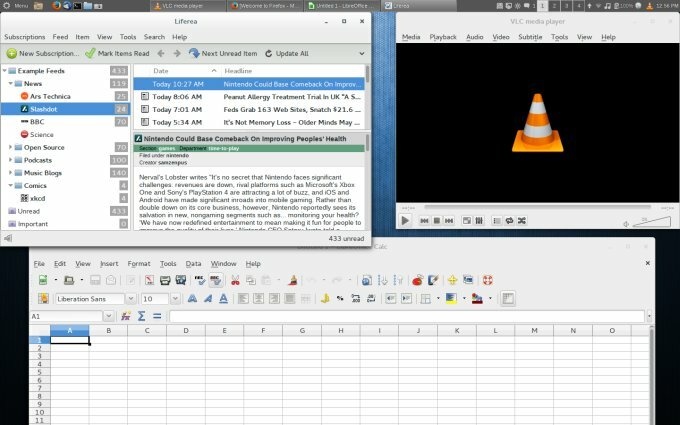 There's Firefox, Thunderbird, GIMP, LibreOffice, VLC, Liferea, Deluge, and some others. 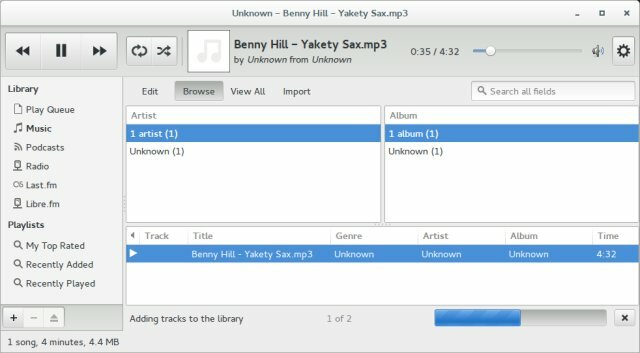 Getting a bit spicy, you have a lot of multimedia and graphics utilities available, including recordMyDesktop, Handbrake, ShotWell, OpenShot, and others. Too many in fact. Then, things really get odd when you browse all of the choices available under the system menu. What is darktable, for example? 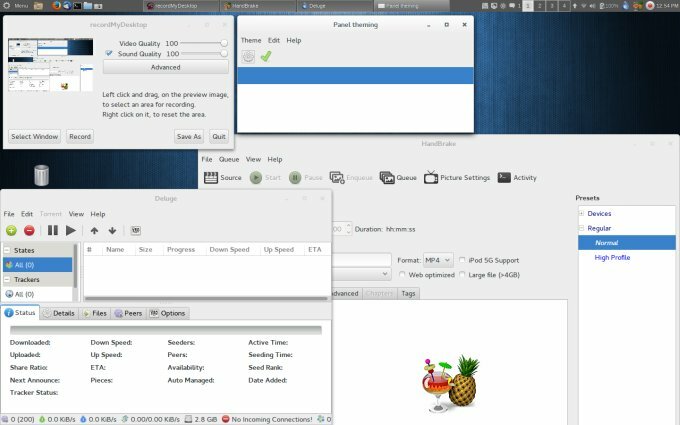 What does Panel theming do? And why do I need LASH, to name just a few. The list goes on and on, even as your eyebrows go up and up. I can understand the motivation, but slapping two dozen programs onto the base distro can hardly be called the art of remastering. Anyone can do that, and I fail to see the common strategy here, something that unifies in purpose and spirit all of the applications featured in Korora Peach. Perhaps I am missing something, or maybe this is just zeal taking over the bandwidth ship. 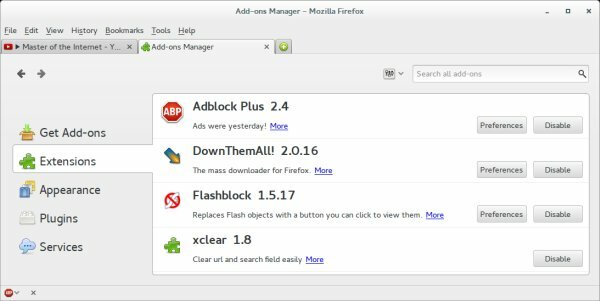 One more thing that bothered me was Firefox and its add-ons. 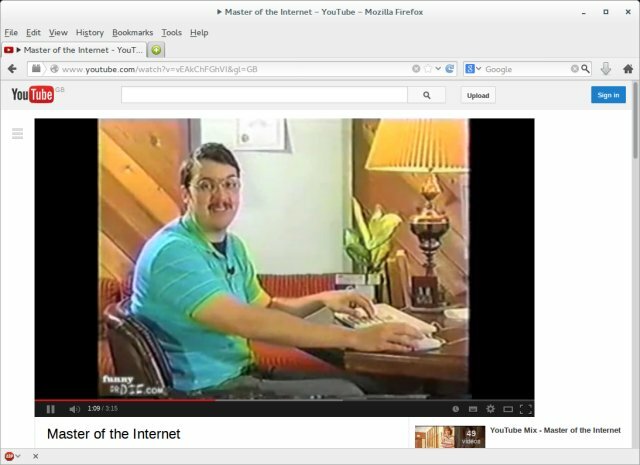 I do not like when distro owners make choices based on how THEY surf the Internet. It's not about them, so they should keep it neutral. Lots of forked distros make this error. Kororaa had this as its Achilles' Heel, and Korora is actually missing the whole foot. There's no option to add new printers in the system settings menu. Not a local one, let alone a Samba share. Wowser. We can't really benchmark performance and resource usage, but you can feel this is not the fastest distro of them all. Sometimes, with a bunch of programs running, the application windows would render slowly on the screen, and I blame Gnome for that. Suspend & resume were ok in the live session. Before we conclude, we must discuss the reality a little bit. For me, even since Fuduntu came about, and then was murdered brutally, it became the golden standard for comparison for all other Fedora spins and remixes. Hence, we must ask, was Korora created with any regard to Fuduntu, and how and why? 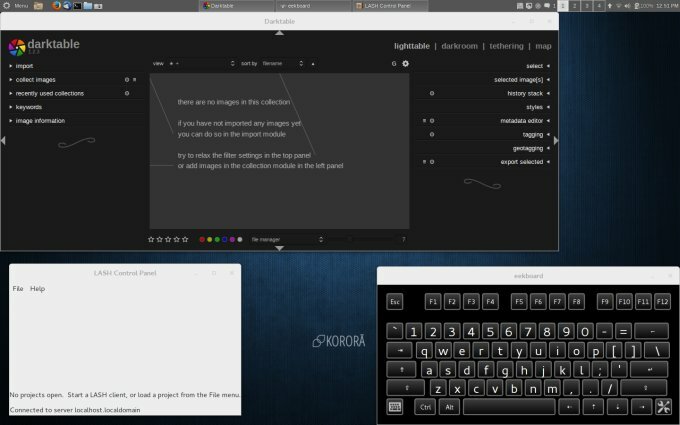 The second question is, do we really need this distro now that Fedora is rather useful and successful? You, do recall my review of Heisenbug, there's a fine distro right there. Hardware compatibility is not the issue here. I am actually going to take it out of the review considerations, because sometimes, things like that happen. I will grade Korora based on its performance, not speculations what could have been had it booted all the way into the installed desktop. So what gives? Korora 20 Peach is an interesting, colorful desktop operating system, but it lacks finesse and order, and feels more like an experimental beta rather than a solid, well-packaged product with its own unique identity. I think you're better of taking Fedora and beefing it up to what you want than stripping Korora of its excess fat. Moreover, where it did work, things weren't too shiny. Too many programs, the visual style needs quite a bit of polish. All in all, Heisenbug seems like a much better, more robust choice. Unfortunately, I can't give too many points to Korora. I was hoping for a nice juicy peach, but it did not turn out to be like that. Something like 5/10. Let's see what the next version can do. Peace.